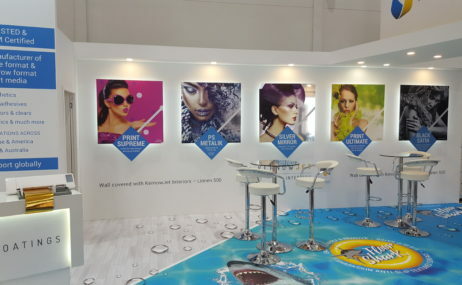 Kernow Coatings will use Fespa 2017 to showcase new media, including KernowJet FloorShark and KernowJet Interiors. FloorShark is an easy-to-apply and remove floor graphic film, designed for hard floors and carpet tiles. Using Kernow’s ‘sharkskin’ coating technology, the resultant floor graphics are said to be tough, vibrant and R10-certificated. FloorSharK does not need to be laminated. Interiors is HP-Latex certified and available in a range of surfaces, two different weights, with a special twin inkjet layer for the widest colour gamut, and can be applied and removed without residue. It incorporates BioPruf to resist mould and mildew. The company has said it will unveil additional media at the show in Hamburg next month.